Welcome to the Schroeder Research Group! We are a synthetic chemistry group based at the Chemistry Department at University College London. Our research activities focus on the design and synthesis of functional materials for organic electronic applications. We are particularly interested in finding creative solutions for energy and healthcare applications, by exploiting the unique properties of π-conjugated molecules and polymers. We take an interdisciplinary approach to problem-solving and work closely together with colleagues in chemistry, physics, materials science and engineering to develop and study the materials powering tomorrow’s technologies. December 2018: Lewis showcased the group’s research at the annual UCL Chemistry PG research open-day. November 2018: Bob gave a talk at the MRS Fall Meeting in Boston, entitled “Organometallic coordination polymers for thermoelectric applications”. November 2018: Zilu and Lewis presented posters of their organic thermoelectric research at the annual CAM-IES advisory board meeting. November 2018: Bob attended the 3rd workshop on “semiconductor materials” organised between Tokyo Tech, McGill and UCL. Many thanks to our Japanese hosts for the wonderful organisation and excellent scientific exchange. November 2018: Bob visited the North London Collegiate School in Jeju for a week-long outreach event, introducing students to university teaching and current organic semiconductor research. Many thanks to Toby Bate for the invitation and amazing organisation. October 2018: The group is growing steadily, as evidenced by the new group picture! October 2018: A warm welcome to Yifan and Nayanthara who will be working on their MSc projects in the group. October 2018: Welcome to Weipeng and Yassin (jointly supervised with Dr Krešo Bučar), who will be conducting their MSci research projects in the group. September 2018: Yasmin joined the group for her PhD, focusing on the synthesis of organic semiconductors for biomedical imaging. July 2018: Congratulations to Saumya for getting her review on the recent progress in high‐mobility organic transistors published in Advanced Materials. July 2018: Huge thanks to Sam, who is leaving the group, for all his hard work and friendship over the last months! We wish him the best of luck for his future adventures. June 2018: Zilu showcased her work on organo-metallic coordination polymers at the PhD poster symposium at UCL. Good job! June 2018: Lewis and Sam presented their research at the ICOE 2018 in Bordeaux, while enjoying the culinary delicacies of the Bordeaux region. June 2018: Bob spoke on “using chemistry to control organic semiconductor morphology” at the Yamaguchi-UCL Choshu Chemistry Symposium. June 2018: Sam presented his poster on “in-situ formation of PEDOT fibres for thermoelectric applications” at the 2nd meeting of the UCL Soft Material Network. May 2018: Bob has been to Texas A&M in Qatar for a research visit. Big thanks to Prof. Al-Hashimi for the invitation and his hospitality. April 2018: Bob gave an invited seminar at the Leibniz – Institute for New Materials in Saarbruecken. Many thanks to Prof. Tobias Kraus for the invitation and the wonderful organisation! March 2018: The Division of Polymer Chemistry invited Bob to the 255th ACS National Meeting in New Orleans to give a talk on “design considerations for organic thermoelectric materials”. This also presented a wonderful opportunity to catch-up with old friends! March 2018: Bob was invited by the Pembroke College Stokes Society in Cambridge to give a talk on the development of synthetic skin. Many thanks to Mairenn, Daniel and Oli for the organisation and the fun evening! February 2018: Sam undertook an outreach activity with Dr Alex Wragge-Morley (History of Science) at the Institute of Making to re-create an ancient 17th century experiment by Robert Boyle, known as the ‘reduction to the pristine state’. The naturally derived chemical camphor is reduced (dehydrated) using oil of vitriol (concentrated sulphuric acid) – The initially white solid which has a strong mint like smell has now been dissolved into the sulphuric acid and the smell has gone. On addition of water, the reverse reaction occurs and the white solid crashes back out of solution, with the strong smell to boot – holding the exact same properties as before. Boyle claimed this as evidence for the resurrection of Christ. The reduction of the camphor from the pristine state presented the disappearance and subsequent perfect reappearance of the substance. This recovery from apparent annihilation was supposedly analogous to the resurrection itself. For further discussion, please see Robert Boyle and the representation of imperceptible entities. January 2018: Zilu and Lewis attended Imperial College’s Plastic Electronics Winter School in Bergün, Switzerland. Besides a series of exciting talks on organic semiconductor research, Bergün offered plenty of opportunities to relax and enjoy the snow! January 2018: The Research Group relocated from Queen Mary University to University College London, for Bob to take up a lectureship in organic chemistry at UCL. We would like to thank everyone at the MRI and SBCS for a wonderful time, and all the support provided over the years, but are looking forward to a new adventure ahead! December 2017: Bob gave an invited talk at the Green Carbon ETN on “organic semiconductors for energy generation”. Thank you, Dr Ana Sobrido for organising such a fun event at QMUL. December 2017: Congratulations to Miaomiao for successfully passing her 3-months PhD progression assessment! November 2017: Bob contributed a talk at the MRS Fall Meeting in Boston, entitled “Thermocleavable side chains – a gateway to new processing routes for semiconducting polymers”. November 2017: Bob was invited to King Abdullah University of Science and Technology (KAUST) by Prof Derya Baran to guest lecture on organic semiconductor design for photovoltaic applications. Big thanks to Derya for organising a spectacular trip! October 2017: Many thanks to Dr Ana Sobrido for organising the first QMUL-UCL London Energy Materials & Devices Hub Symposium. And congratulations to Lewis and Sam for giving enticing talks on organic thermoelectrics and photovoltaics, respectively. October 2017: Dr Samuel Cryer joined the group as a Teaching & Support Lecturer funded by the Leverhulme Trust. September 2017: Welcome to Miaomiao, who is joining the group for her PhD studies funded by the Chinese Scholarship Council (CSC)! September 2017: Bob was invited to the São Carlos Institute of Physics to talk about the development of bionic skin. Many thanks to Prof. Gregório Faria for the invitation and hosting my visit! September 2017: Bob gave an invited talk at the Brazil MRS in Gramado. Many thanks to the organisers for the kind invitation. September 2017: A warm welcome to Dr Saumya Singh, who will be conducting her postdoctoral research in the group, generously funded by the Newton Fund. August 2017: Congratulations to Zilu for her contribution to the book chapter “Organic Thermoelectric Composite Materials”, now published in “Comprehensive Composite Materials II“. Great job! August 2017: Bob had the pleasure to give an invited talk at the SPIE Optics & Photonics in San Diego, entitled “on the importance of alkyl chains in organic semiconductors”. Many thanks to the organisers for the kind invitation! August 2017: Congratulations to Lewis for passing his 1st-year progression assessment! July 2017: Bob gave an invited seminar at Swansea University on “the importance of alkyl chains in organic semiconductors”. Big thanks to Dr Matt Carnie for hosting my stay! June 2017: Bob had the pleasure to participate in this year’s subject enrichment session at the North London Collegiate School introducing the concept of electronic skin to teaching staff in the Science Department. May 2017: Lewis presented his poster on “intrinsic doping in naphthalene diimide semiconductors” at the annual MRI Spring Symposium. May 2017: Congratulations to Zilu for passing her 1st-year progression assessment! May 2017: Bob gave a talk at the Spring e-MRS in Strasbourg on “controlling charge transport in semiconducting polymers with branched alkyl side chains”. April 2017: Bob gave an invited seminar talk entitled “From flexible displays to electronic skin” at the Chemistry Department of the Middle East Technical University (METU) in Ankara, Turkey. April 2017: Bob got awarded a Leverhulme Research Fellowship to design “conducting polymer fibres for thermoelectric fabrics”. March 2017: We secured funding from the British Council under their Institutional Links Program to investigate “interface design for high-efficiency solution processed solar cells” in collaboration with Prof. Levent Toppare’s group at Middle East Technical University (METU) in Ankara, Turkey. March 2017: Zilu presented her recent work on organo-metallic coordination polymers during her 1st year PG research talk. Good job! March 2017: The North London Collegiate School‘s Science Society invited Bob to give an outreach talk on electronic skin at their “Science Cafe” session. February 2017: Lewis gave his 1st year PG research talk, entitled “intrinsically doped polymers for thermoelectric applications”. Well done! February 2017: Bob gave an invited talk at the Printed and Flexible Electronics Congress in London. January 2017: Congratulations to Lewis for getting his review on organic thermoelectrics accepted for publication in ECS Journal of Solid State Science and Technology. Our review on the recent progress in high-mobility OFETs got published in Adv. Mater. Our work with Stanford University on a biodegradable pressure and strain sensor got published in Nature Electronics. Our collaborative work with Imperial College and Uni-Potsdam got published in J. Phys. Chem. Lett. Our work on semiconducting polymer orientation and the effects on charge transport got published in Advanced Functional Materials. Our collaborative work with Imperial College on OPV blend morphologies got published in J. Phys. Chem. C.
Our review on bithiazole containing polymers got published in Macromolecular Rapid Communications. 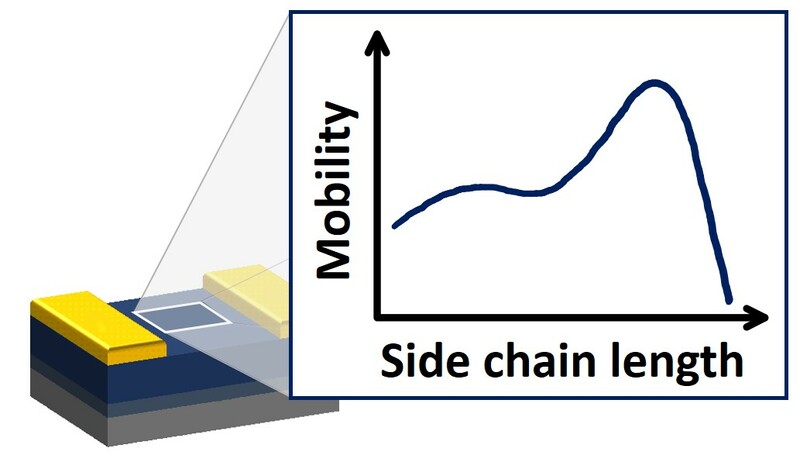 Our research conducted in collaboration with Stanford University on roll-to-roll printed all-polymer solar cells got published in Advanced Energy Materials. Our review on organic thermoelectrics written in collaboration with colleagues at Swansea and KAUST got published in ECS Journal of Solid State Science and Technology.